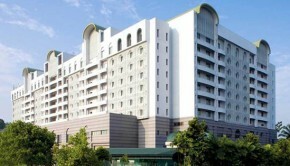 Sri Enstek Hotel is a popular option for accommodation among the tourists and repeat visitors to Kuala Lumpur. The hotel offers complimentary access to Wi Fi. There are a number of rooms which feature intricate wood furnishing and wall art that is brightly painted. The features include flat screen television and other basic facilities like electric kettle. The rooms offer attached bathroom that have hot shower facilities. The guests can get a hairdryer and an iron upon request. Coffee and tea makers are available in all the rooms and the guest can serve themselves with breads and cakes as and when they like. Get the lowest rate of Sri Enstek Hotel at Agoda Now!